Making writing goals is a common activity at the beginning of the school year. But it is essential that students understand the range of skills they could be working on if they are going to make skills which are both effective and achievable. Before students can make thoughtful and useful writing goals, they need to know what is expected of them, what good writing looks like, and what skills they need to master to create their own good writing. When we ask students to make goals at the beginning of the year, we often ask them to be clear in what they would like to achieve. But are we making sure they have a clear understanding of what they should be aiming for? When adults make goals, we usually have an idea of what we are specifically aiming for. If we want to become a better runner, we may do some research on what a good (and achievable) time looks like for different distances. If we’re striving to have a cleaner house, we may read articles on what household jobs need to be done or watch documentaries on decluttering our houses. Having an understanding of what a successful outcome looks like, helps us make more informed goals - goals we’re more likely to meet. The same goes for our students - when they know what they should be aiming for, they’re more likely to create goals which are effective and achievable. In the classroom, students have writing outcomes which come from the curriculum. But curriculums tend to be written for teachers - education professionals who understand specific terms. They are often hard to read without background knowledge so we rarely put them in front of our students. One way we can overcome this is by pulling out the most important elements to present to our students or by rewriting them for our students to understand them. Students can explore these easier-to-read versions of the outcomes before they start making writing goals - they can make them a subject of discussion; look at how they might work to achieve these outcomes, what skills are involved to achieve them or how they can become specific achievable goals. Before we ask students to set writing goals, they should first reflect on where they’re working from. But it is also essential for students to have an idea of what they’re aiming for in their writing - both generally and broken down into specific skills to master. By exploring the writing of others, students can identify what writing skills they want to work on during the school year to make their own writing better. You can share a range of good writing - from picture books to articles to poetry - from the first day of school. This can be done by reading aloud, but you should also make a wide range of good writing accessible for students to read on their own every day. Before writing goals are set, you can share pieces of writing which support different outcomes. 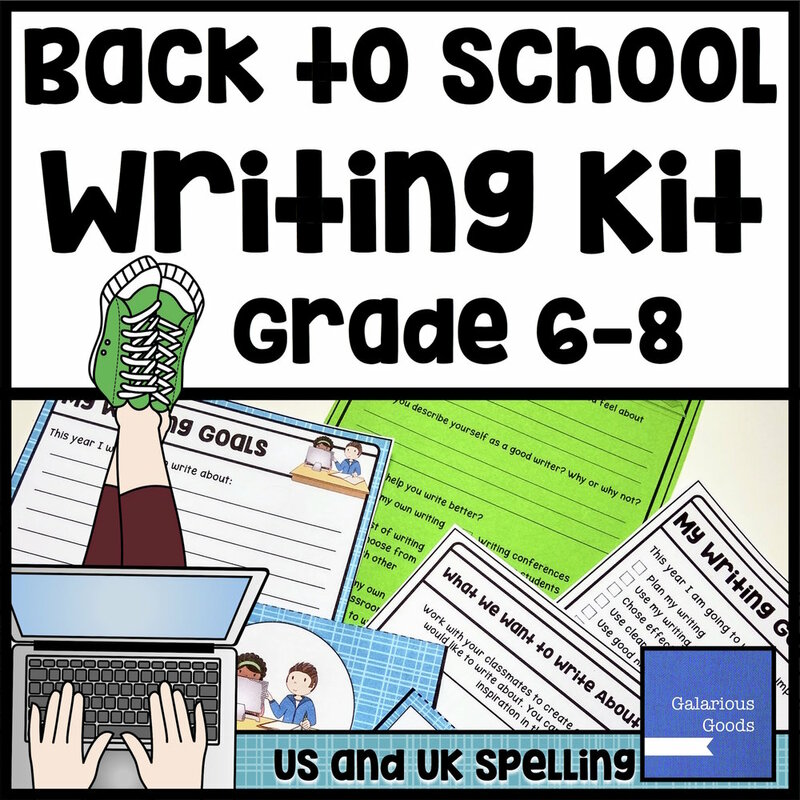 As you read these with the students, you can identify the skills the writers have used to create effective writing, creating a list of skills which students may wish to work on during the year. Writing in front of your students can be daunting, but it can also be incredibly valuable for you and them. Students can see how more experienced writers work to think about their writing, how they work to improve their writing while they write and how they apply skills they have been working on. Demonstrating writing in the first weeks of school, before setting writing goals, allows you to highlight certain skills which you might like students to master. Students are able to watch how you work on those skills and what working on those skills actually looks like and can add those to a list of things they may wish to focus on. Use a piece of your own writing or a professional piece of writing to examine in-depth. You may wish to use your list of skills which you’ve put together from the outcomes or from other pieces of writing and assess whether the author has shown these skills well - and how they have done that. Students can then use this assessment to determine how they might work on improving those skills. For example, students may be focusing on how to use sentences of different lengths to create effective narratives. By examining the sentences in Shaun Tan’s The Lost Thing, students can see how the author puts together sentences to draw the attention of the reader. Students can then make a goal to vary their sentences when they are writing and to revisit those sentences when they are editing to see if they make the writing more effective. By taking a closer look at what good writing can look like, what skills they need to master and what outcomes they are trying to achieve, students can be better informed when they make their writing goals - ensuring that the goals are more thoughtful, more achievable and more relevant to them as writers. It was hot and stuffy in the classroom, the anticipation of the new school year still hanging thick in the air. Miss West had places a worksheet on everyone’s desk and had returned to the front of the room. Bayley wrinkled his nose. He tried to remember some of the writing he’d done last year. He remembered that some of it was really good, but he couldn’t remember what he was really good at. And what did he need to improve? When we ask our students to make writing goals at the beginning of the school year, it can be tempting to jump straight into the goal making process. But many of our students are stepping back into their ‘writing shoes’ for the first time after weeks or months since they last engaged in the writing process. When the first thing these students are asked to do is ‘make writing goals’, students are working from a blank page. They may end up making writing goals, but it’s highly likely that these goals will just be surface goals which don’t really identify where students can effectively grow and achieve in the year to come. As the students tumbled into the room on the first day of school Mr Evans asked them to put their piles of new books at the front of the room. He gave the students fifteen minutes of writing time, before asking them to stop their work. “I guess we’d better do the organisational stuff then,” he joked. What would happen if our students started writing from the very beginning of the first day of school? What message would this send to our students? And how can we use that writing. By using prompts - questions, quotes, pictures or music - we can give our students something to write about in those early days of school. By repeating this daily over the first week or two, we’re showing them that writing is valued in our classrooms, that it’s something we just do. We’re also able to use the writing they produce. It can be used as formative assessment in writing, spelling, grammar and punctuation. By writing daily, we get to see how students change and improve, how they approach different prompts or styles of writing, and students get a portfolio of writing to use as they set their writing goals. Once students have three or four pieces of writing, even short pieces of writing, they’ll have a starting place for goal setting. Students can sit down and read through their work - whether it’s on their own, with a partner or with the teacher - to determine what they’re doing well and where they’d like to improve. Having the writing there in front of them gives them a solid starting place - a concrete example of what kind of writers they are so they can create goals to become the writers they want to be. Freewriting can be a powerful writing tool in the classroom. It can assist students with formulating ideas, creating outlines and even drafting whole pieces of writing. But how can we effectively use freewriting in the writing centres we set up in our classroom? Is it a useful writing centre? And how do we establish freewriting writing centres to ensure they work? Freewriting in the classroom is a timed writing exercise. Students are provided with a writing prompt, which they respond to with a steady stream of words. They are not required to stick strictly to the provided prompt (which might be a picture, a quotation or a question), but can write anything which comes to mind - as long as they keep writing until the timer does off. When the time is up, students may store their writing for future exercises or use it immediately as a launch for writing. Writing centres can be used in the classroom to provide a variety of activities for our students to complete. Students may move independently between activities designed to reinforce and improve skills in spelling, grammar, punctuation and writing composition, or they may rotate through these centres within a group at the direction of their teacher. Whether you have established writing centres or you are planning to use them in the classroom for the first time, freewriting can be easily included - allowing students to practice using prompts to guide their writing. Adding freewriting to your writing centres requires only a few simple things. The most essential is a collection of writing prompts which students can use to spark their writing. These may be connected to units of work you are studying in the classroom, or they may be connected to holidays, seasons, student interests or popular culture. Although you may collect or create a large collection of writing prompts, it is important to limit the choice that students have immediate access to. You may like all the students at the writing centre to work from one writing prompt, or you may offer a small collection of related prompts with just a few more options than the number of students - allowing limited choices and opportunities for swapping prompt cards. If you are reusing your writing prompt cards in your classroom at a later time, you may like to print them onto card or laminate them to extend their lifetime. It is worthwhile to organise all your writing prompt cards in a single location to allow you to find them when you wish to use them again. You also require a timer so students can write without having to keep an eye on a clock. You may like to find an old fashioned kitchen timer, dig out a digital timer or search for timing apps or websites on a computer or tablet which is accessible to the students working at that writing centre. Finally, students will need writing paper and instruments to participate in freewriting. You may request students to bring their own writing tools to the freewriting centre or you may keep a collection of writing instruments and paper available for students to use. If you are providing paper, you might like to create a range of options - including lined and unlined paper and paper which comes in different colours as well as white. Freewriting sounds easy, but can be a little overwhelming when it is presented cold to students. To warm students up, freewriting should be introduced to the class before it becomes a regular writing centre. Model it to your students, allow them to experiment with whole class freewriting individually, as pairs and in small groups. Engage in freewriting along with your students - both as whole group exercises and when you do offer it as a writing centre. Nominate a student to be in charge of the timer - this protects student writing time! Allow students to share their freewriting if they wish to. Provide them more time - or another writing centre - where they can read over freewriting they have completed and highlight or note sections which they would like to expand on at another time. Model how they may choose to keep or throw out certain pieces of freewriting. Freewriting is easily included as part of your regular writing instruction in the classroom. Using a freewriting writing centre allows students to get used to regular freewriting, allowing them to spark creativity in their writing and become more fluent, proficient writers. There's nothing scarier when we're teaching writing in the classroom than the blank page. Or, to be more accurate, the reaction of our students to the blank page. There is a way to relieve the fear, though, with a simple writing strategy - freewriting. A very basic definition of freewriting is writing anything you like for a set time period without stopping. The writer sits, with their paper and pen or computer, sets a timer and writes until the timer (usually set between five and twenty minutes) goes off. They can write about anything which comes into their mind, as long as it's in sentences (differentiating it from brainstorming). They might write the beginning of a story and can keep it going, or they might write a string of unconnected sentences - ranging from what they had for breakfast to how much their hand hurts. If the writer is not sure what to write, they can acknowledge that in their writing - writing sentences about how they don't know what to write until a new topic comes to mind. While the writer might let their writing go wherever they like, they might also focus their writing with a writing prompt. This writing prompt might be a picture or a photograph, it might be a poem or a quote or it might be a question or a topic. The writing prompt allows the writer to put down everything they know or feel about a topic or idea or picture, although their writing might still wander away from the topic. Another aspect of freewriting is that writers are not allowed to go back to make corrections and they do not need to be concerned with spelling, grammar or punctuation. This allows for perfectionism to rest for a little while - perfect if you have students who are concerned with getting their writing 'right' and therefore never get much written down. Freewriting is often used at the beginning of a writing session. It's thought to 'blow the cobwebs out' before getting into the serious writing for the day. Getting into the physical and mental mindset of writing allows for writing sessions to be more productive. Others, writers or not, use freewriting at the beginning or end of their days to get thoughts and ideas out of their head and onto paper (or the computer screen). How can we use freewriting when we're teaching writing? If you are using the writer's workshop approach in your classroom, you can easily use freewriting every day. You can allocate five to ten minutes to silent, timed freewriting at the beginning of each writing session, allowing students to get into the writing mindset before they move onto planning, writing, editing, conferencing or small group lessons for the rest of the writing time. Freewriting can also be used as a way to launch writer's workshop - showing students one writing strategy which 'real writers' use as they learn to manage their time and their writing. You can also use freewriting when you set a new writing task for your students. Students might write anything they like during the freewriting time, or they can write to the topic or a related prompt set for them. This allows them to get past the dreaded 'I don't know what to write!' and may help them discover new writing ideas or directions for their writing task. Freewriting can be used to spark creativity when you're teaching creative writing, especially less familiar styles like poetry and descriptive writing. Students can use their freewriting to find themes, ideas, phrases or words that they would like to explore further, or they can swap their freewriting with others to find new directions which they may not have thought of before. Using prompt cards (like these ones from the Galarious Goods shop) for freewriting can be a great way to inspire poetry writing as the random nature of freewriting may get students to consider aspects of the prompt they haven't thought of before. You can also use freewriting when you're approaching a informative or persuasive writing task. Students can read through their research or brainstorming ideas and then use the freewriting time to note down everything they know or feel about a topic. They can use this time to begin to organise ideas and get a feeling for what they're going to write about and come back to their freewriting when they're unsure of what to write next. This is particularly useful when students are writing across the curriculum as it shows them that their writing strategies are not confined to 'writing lessons'. Finally teachers can use freewriting as part of their writing lessons to create a community of writers. They can schedule it in at the beginning or the end of the writing lesson to create a space where all students (and teachers) are actively engaged in writing. At the end of the time, everyone will have a piece of writing - even one with errors or unrelated sentences - as well as the feeling that you're all working together; even when you're working on different pieces of writing. Want to use freewriting prompt cards in your classroom? These scenery prompt cards are perfect for writer's workshop, for inspiring poetry or descriptions or any freewriting session. I adore poetry - I still remember early lessons on haikus back in my Grade Three classroom. I love reading it and finding little gems of words. And I love writing it and manipulating language and rhythms until the paint little pictures in words. Poetry can be amazing in the classroom. It's relatively easy to fit into smaller segments of language. It's perfect for exploring literary and language skills like figurative language. And there's poems for all situations - funny poems, sad poems, serious poems. You can even explore verse novels and how an author can put together a series of poems to tell a story. Here's three ways to bring poetry into your classroom. Poems often use a few words to create pictures, so they're perfect to combine with art. You can start with using one to inspire another - students can write a poem inspired by a piece of art or create a piece of art inspired by a poem. This can be especially effective when you're looking at particular styles of art - abstract art or sculpture - or if you try to create art work which reflects particular patterns in a poem - what might a limerick piece of art look like? Students can also combine poetry and art in one piece. Found poetry and black out poetry are fascinating ways to combine both, as is exploring calligraphy or typography. Students can look at how poetry can be a part of public art or how words, colour and shapes can be combined to create something beautiful. Due to their shorter size, poems make wonderful subject for displays. And seeing poetry all around us is a great way to inspire thinking about poetry and more poetry. There are a few ways you can display poetry in the classroom. If you write or explore poems on a particular theme, you can use that to create a display - autumn poetry can be displayed on colourful trees made out of paper, beach poems can be written into a beach scene. Teachers can also incorporate poetry into the classroom - even displaying them where you wouldn't expect them - a poem about numbers near the maths equipment, a poem about nature tucked near a window. These could even form the basis of a poetry treasure hunt, with students searching to find all the poems. Students can also use a display board to create their own poetry. They can use pieces of paper or magnets with words on them and arrange them to create poetry. They can also write lines of poetry to pin up on a board to continue a poem which is being written. Beyond the classroom, students may like to look for other places they can display their writing. You may be able to display poems in the school library, the office or the hallways. If you have classroom windows which can be seen outside, you may like to display poems there where other students, teachers and parents can see them. Or a local shop may be able to offer space or a notice board for students to display their poetry to a wider audience. While poetry and songs are two different forms of writing, it's not hard to see the similarities between them. They both use rhyme, rhythm and highly effective word choice to make you feel something. So how can we use them together? Students can use lines of a song to inspire their own poems. Starting with one or two lines and then continuing in their own poem allows them to think about what those lines might be saying and how they can continue that in their own words with their own experiences. Examining the structure of songs also allows students to play with structure in poetry. This can be especially effective with songs which change structure between different parts or between chorus and verses - how do they change their writing style? How can students experiment with that. Students can also think about how already written songs could be set to music. What kind of music could they set the poems to? How would it change if you used a different style of music? Take a moment to share some poetry with your students and open up a whole world of different rhythms, rhymes and pictures made out of words.